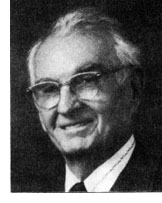 Dr. Pat Cusack was the Spalding Irish team physician from the early 1940's until 1966 when he was succeeded by Dr. Kenny (also a Neve Harms recipient). He was associated with the legendary Ennio Arboit (a previous Hall of Fame Inductee) during the years Irish teams were Peoriarea "monsters of the gridiron." Known simply as "Doc", even to his nine boys and two girls, Dr. Cusack, the long-time, easy recognizable East Bluff resident, graduated from Elmwood High School. He worked his way through Bradley University where he was captain of the baseball team. Following graduation from the Loyola Medical School in Chicago, Dr. Cusack began his medical career as a General Practitioner on Peoria's Southside, where $2.00 office calls and $3.00 house calls (remember them?) were the norm. He abhorred cigarette smoking, and would never set foot in a tavern. He was attending physician for just about every type of sporting event in Peoria, and was a fixture at the old "top of Main Street" Arena (a grocery store parking lot). As part of a battery of doctors at the Golden Glove finals in Chicago, he examined Mohammed Ali (then Cassius Clay). "Doc" regularly examined most of Peoria's Golden Glove participants. When Spalding revived baseball in 1945, Dr. Cusack anonymously donated money for the program, including replacement of the twenty-year old uniforms Coach Father Sylvester pulled out of mothballs tattered and worn with a huge "Gothic 5" across the chest. He was a friend and great admirer of A. J. "Robbie" Robertson. His closest doctor friend was Dr. C.V. Ward, whose son Clarence is also being honored with the Neve Harms award. From "Doc's" son Pat,"Dad would be most proud to be in Clarence's company." The name of Corwin "Cornie" Clatt has become a household word among area football fans. Clatt, a high school, collegiate, and NFL football standout, later coached at East Peoria High School, his alma mater. During Clatt's four years of play at East Peoria High School, the Red Raiders amassed a record of 26-5-1. As a senior in 1940, Clatt was chosen as a first-team allstater and was named the outstanding high school player in Illinois. Playing for Notre Dame under Coach Frank Leahy, Clatt was the leading Irish ground-gainer in 1942, with 138 carries for 698 yards. That team's record was 7-2-2. Clatt was also an outstanding defensive player in the days of two-way football. He once ran 82 yards for a touchdown on an intercepted pass play, and was selected a third-team all-American defensive player. Clatt also played on two Notre Dame national championship teams in 1946 (8-0-1) and 1947 (9-0). 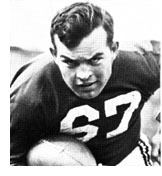 Clatt played several seasons as linebacker for the Chicago Cardinals of the NFL, playing in the championship game in 1948 against Philadelphia. In 1957, Clatt become East Peoria High School football coach and also coached the track team, which won the Mid-State 8 title in 1963.